Philadelphia, PA 2004-2008 This impressive, LEED-certified, fifty-six-story office tower is Philadelphia’s newest and tallest. 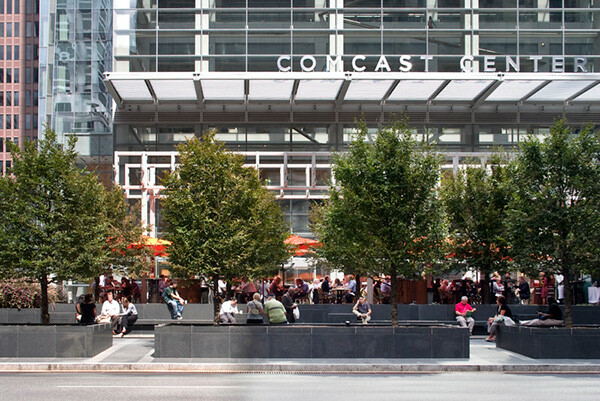 The Comcast Center’s stateliness and elegance are carried through to OLIN’s plaza at its base. 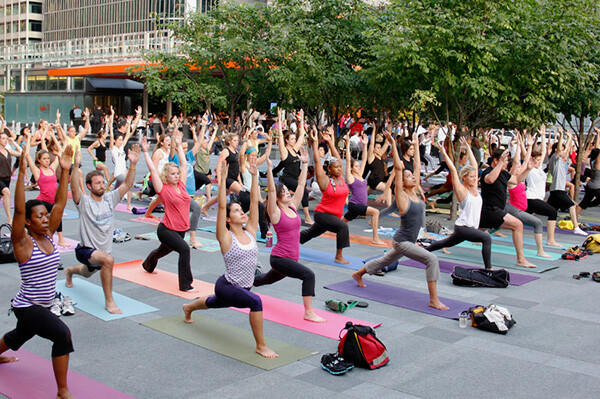 However, the plaza is more than merely a suitable platform for the building — it is a vibrant, well-used, civic space, wholly connected to the city. It serves as a new destination for residents and workers, and as a principle entry to the regional rail lines, markets, and food court located beneath the site. The plaza elements are conceived as a series of vertical and horizontal layers. Along its most civic-facing edge, a sheared aerial hedge defines the plaza and filters the noise and activity of bustling John F. Kennedy Boulevard. Emerging from planters with integrated seating, the double-layered hedge frames a pleasant pedestrian route that is unique to the city. 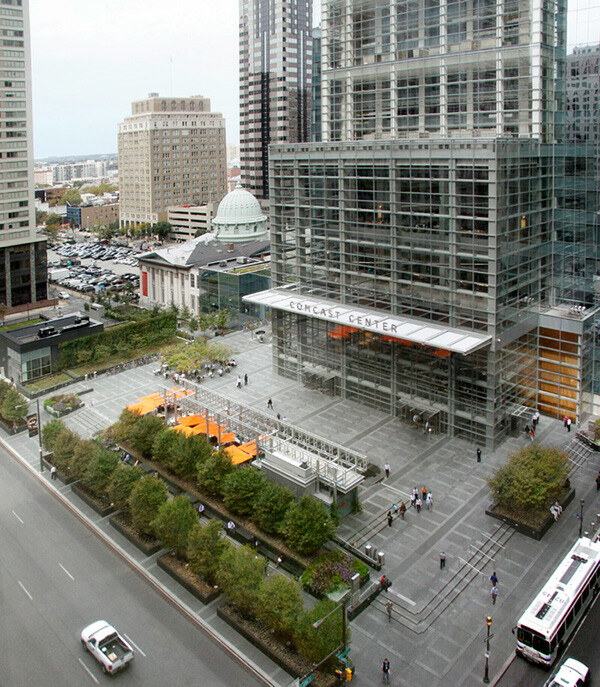 The plaza itself is elevated slightly above the surrounding sidewalk, and in concert with the height of the aerial hedge, views are strategically controlled into and out of the space. On the plaza, a plinth supports a café servery housed in a distinctive, illuminated glass box slipped beneath a sculptural trellis of dichroic glass, steel, and vines. 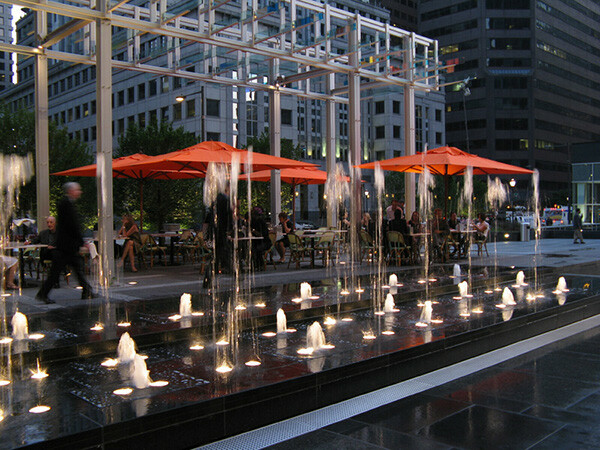 A dynamic fountain provides a linear veil between the plinth and the main plaza. The plaza is paved in a pattern of granite bands that reinforces the structural grid of the tower. To connect the exterior to the interior both visually and physically, the paving extends into the building’s winter garden. Above the winter garden, five forty-foot atria rise, housing substantial, yet playful, hanging vine-covered scrims that work to shade the sun. The dramatic scrims produce the final vertical landscape layer of the plaza composition.